Actually, I can’t prove that it does, but according to Google Translate, the above means “The FUN is in the RUN!! !” in Japanese. One of the cool things about the interwebs and hot rods is that I’ve got hot rod buddies all over the world. I think that it was from some of the mutual hot rod groups, on Facebook, that caused Kiyoshi Tomitsuka and I to get connected online. I always enjoy Kiyoshi’s photos. Mostly action shots, from being out and driving his ’35 sedan, and there’s usually a blue ’40 sedan, a candy red ’40 sedan, a ’36 Ford Panel truck and a few others along with him. Thanks, Kiyoshi, for letting me post a few of your photos. Wow, that 40 looks great. The Americans are perfect for it. Thanks for posting these Bret. Japan, who woulda guessed? 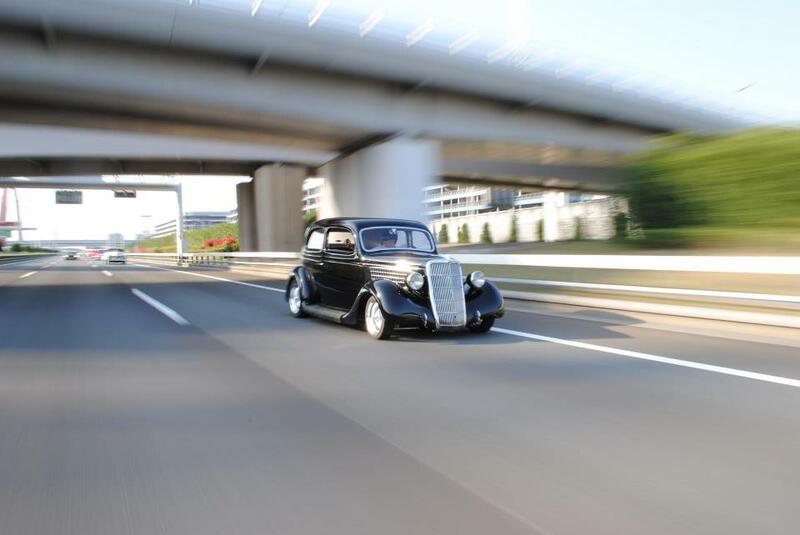 Great photos, love the ’35 “on the move”! !